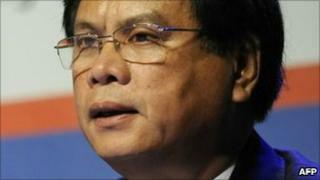 Laos has announced it has a new prime minister after the surprise resignation of Bouasone Bouphavanh. Mr Bouasone, 56, who had spent more than four years in office, is replaced by Thongsing Thammavong, of the communist-dominated National Assembly. Mr Bouasone cited "family issues" but analysts say the reason for his resignation was more likely the product of internal factional re-alignments. Laos is due to hold a general election early in the new year. A government spokesman said Mr Bouasone would remain a member of the central committee of the Lao People's Revolutionary Party, which holds a near monopoly on power. The new prime minister was approved unanimously by the National Assembly's 101 members. Political shifts are carefully choreographed in the People's Democratic Republic of Laos, a large but under-populated, land-locked state bordering Vietnam, China and Thailand. "Sifting the tea leaves, this is a shift in the internal factional alignments, a shifting in the balance of power within the politburo," said Damien Kingsbury, chair professor in the School of International and Political Studies at Deakin University in Melbourne, Australia. "It is certainly not transparent, but it happens from time to time," he told the BBC. He said there was unlikely to be any major shift in policy as a result of the change in leadership, adding that China's growing prominence in the country was likely to continue. Laos is one of Asia's poorest nations and relies heavily on foreign donors. China has made huge investments in Laos, building roads, and agricultural and industrial estates across the country, which has long been politically close to Vietnam. A high-speed railway is planned to run from China to Laos. Laos former prime minister said earlier this year that the country could achieve at least 8% annual economic growth to 2015, "to lift the country from underdevelopment by 2020". Critics say that large foreign investment projects form the the basis of this growth strategy. Non-governmental organisations have warned against importing foreign labour, and of the potentially negative impact on the environment and socio-economic development.